Your order request number [xxxxx] has been received and is now under process. 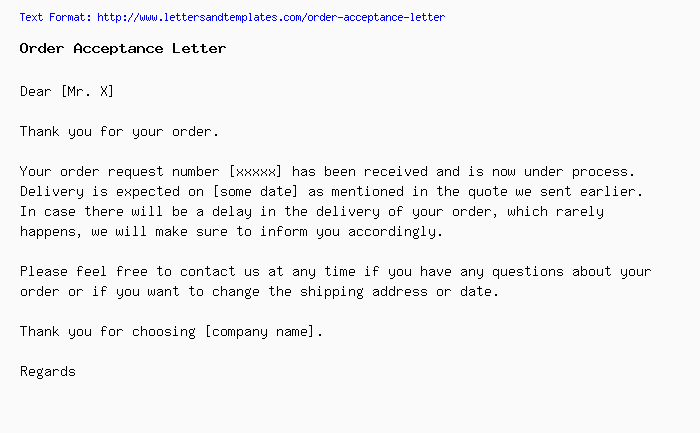 Delivery is expected on [some date] as mentioned in the quote we sent earlier. In case there will be a delay in the delivery of your order, which rarely happens, we will make sure to inform you accordingly. Please feel free to contact us at any time if you have any questions about your order or if you want to change the shipping address or date. Thank you for choosing [company name].